As a 30 something woman I understand now more than ever what it's like to see you skin literally age before your eyes. When I was a care free teen and 20 something it was all about natural and growing old gracefully (grey hairs and wrinkles too), it was inevitable right? So no help to keep me looking fresh other than a cheep moisturiser. Well looking back on it how wrong was I? It wasn't until I decided to retrain as a beauty therapist that I fully understood how important it was to use the correct products on your skin even as a teen. So here I am in my 30's trying my hardest to ensure my skin is the best it can be and well looked after, Hindsight is a wonderful thing! I'm not talking about fillers and face lifts I'm talking about what you can do at home everyday to keep your skin in good condition. And now the shop is literally your oyster when it comes to professional treatments at home. 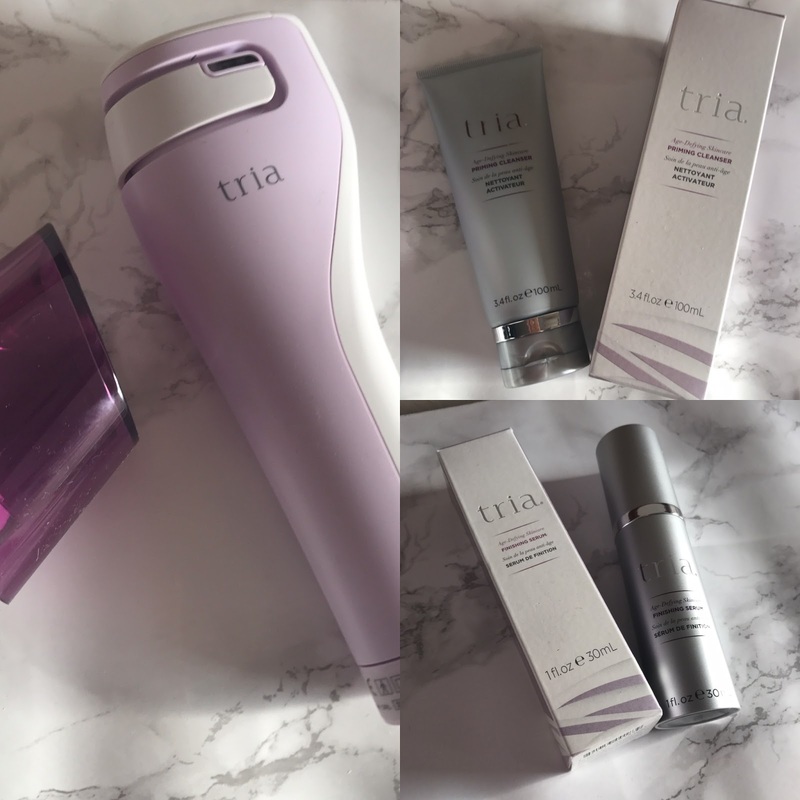 I was asked to trial Tria at home, it's a hand held devise which uses beams of light to enter the skin to promote collagen and elastin production. These are what are used to keep the skin taunt and help combat wrinkles. "Tria has conducted extensive clinical studies with leading dermatologists. These studies demonstrated that the Tria Age-Defying Laser is safe to use at home. The Tria Age-Defying Laser also has EU certification"
I used Tria almost every day with the odd exception, it's a fairly lightweight hand held light laser which is exceptionally easy to understand and use. It has 3 settings with each setting the use time and intensity increases. Always start on the lowest setting until your skin is used to the device and sensation. I was on setting 1 for approximately 10 days, this allowed my skin to adjust to the laser and make going to setting 2 a breeze. I was on setting 2 for around 15 days ,I wanted to ensure my skin had become fully used to the current setting before going onto the final setting of 3. As will all beauty treatments of this style you will feel a sensation whilst using the laser, I would be surprised if I didn't feel it doing anything and with a qualification in beauty therapy techniques and anti ageing treatments this is an absolutely normal feeling and sensation for the skin. After the treatment my skin experienced erythema (redness of the skin caused by stimulation) this is very common and can happen in most treatments including massage and it subsided within an hour. I am so impressed with this at home laser, as I have experience with professional lasers this is a fantastic contender. It's easy to use and gives fantastic results. My skin looks 20x better than it did prior to using. My lines are not as deep or permanent and my skin looks brighter. It comes with all the information you need to safely use it with a very comprehensive information book. Simple 3 stage settings and stand to ensure your laser is kept in good condition. I would highly recommend using the products that are available to buy with it as they have been designed especially for use with this laser. You may well find if you opt to use a different brand the results may vary as this has been designed to work as a package. As far as my skin is concerned I would only use it with its own products. The Tria age defying laser starts at £450 without promotional discounts. This is for the laser alone. Personally I feel it's a better deal buying it as a package at £495 as this comes with the cleanser and serum that is recommend to use with the laser.